What is a LUT and a HALD? A Look-Up Table (LUT) is a file containing math instructions to replace a color by another one. This process is done pixel by pixel, that gives a very high accuracy. A HALD is a 3D LUT converted into 2D image as JPG or PNG file. The HALD is a pattern containing all color values (pixels) for a specific size of grid. Bigger is the grid, better color accuracy is the output generated LUT. You click on Generate a HALD button to generate a PNG HALD. You open this PNG into your favorite photo editing application and apply a color correction on the PNG HALD. Then you save it as PNG without compression (or in JPG 100% quality). Finally, you click Convert to CUBE and select the modified PNG you just saved. The algorithm will interpret the differences that there are between each pixel of the original HALD and the HALD modified by you. 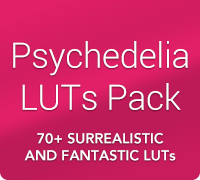 A 3D LUT as .CUBE format will be generated (25x25x25 or 64x64x64, choose in Preferences). Scroll down to discover some video tutorials about how to use. Important note: A Look-Up Table (LUT) can only affect colors, contrast, brightness, gamma, etc. So you can't add grain, noise reduction, vignetting, sharpen or any other dynamic effects. If you apply this kind of elements on the PNG HALD, the output LUT may be corrupted! Convert Lightroom presets for video purpose. Use the power of Adobe Camera Raw on video. Apply third-party app effects on video. 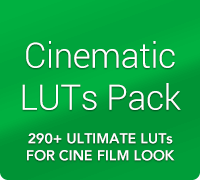 Create your own "LOG to Rec.709" LUTs. 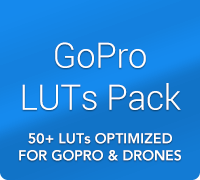 Create a LUT to match colors between two different cameras. 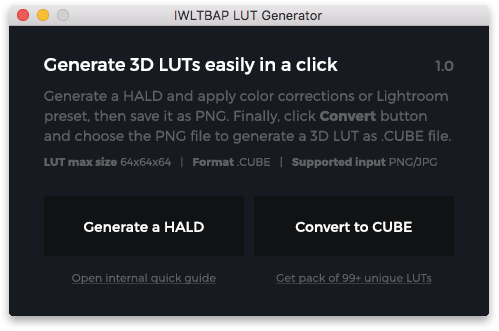 LUT Generator is compatible with macOS (≥ 10.10) and Windows (≥ 7). This utility app is based on pay-what-you-want pricing model. or support creator and pay the price you think is fair. Header image by Radek Grzybowski.